One of the greatest problems in generating awareness for sleep apnea is that all too often people have a preconceived notion of what a typical sleep apnea patient looks like. When most people think about a patient suffering from sleep apnea, an image of a middle-aged overweight male comes to mind. And while this image can be fairly accurate in many cases, it is by no means a full representation of all those who could potentially be afflicted with sleep apnea. Many women suffering from sleep apnea get diagnosed with insomnia rather than sleep apnea due to this misconception. And worse, many children with sleep apnea are instead diagnosed with other disorders including ADHD because they don’t fit the typical patient profile. The prevalence of sleep apnea in children may be much lower than it is in adults (approximately 5% of children compared to 26% of adults aged 30-70 years), but is still common enough to be a cause for concern. Children with untreated sleep apnea run the risk of having behavioral, adaptive, and learning problems. 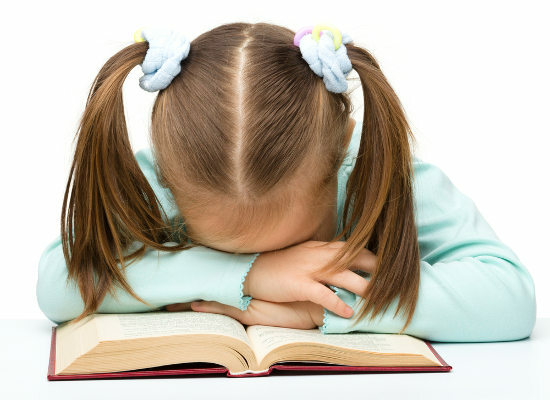 Many of the daytime symptoms of poor sleep caused by sleep apnea may manifest themselves as symptoms very similar to that of ADHD–hyperactivity, difficulty with learning and concentration, and poor performance at school. As many as 25% of children diagnosed with ADHD may actually in fact have symptoms of sleep apnea, and their learning and behavioral problems are instead related to poor/fragmented sleep. Another study showed that the odds of behavioral problems were 4-5 times higher in kids with incident sleep apnea, and 6 times higher children with persistent sleep apnea. These children with untreated sleep apnea were also to found to be 3 times more likely to have grades of “C” or lower. Children with untreated sleep apnea run the risk of developing hypertension and cardiac issues as they grow. Mouth breathing. Children with enlarged adenoids tend to breath with their mouths open. Causes of childhood sleep apnea can vary significantly from the causes of sleep apnea in adults. Whereas in adults the main contributing factors of sleep apnea are weight, neck circumference and age, for children the most common cause is enlarged tonsils and/or adenoids. When these tissues are enlarged they can cause breathing difficulties during the day. When the child is asleep, the muscles in the body relax including those in the throat. The relaxation of these muscles allows the tonsils and adenoids to further restrict airflow in the upper respiratory system and cause apnea events during sleep. Childhood obesity can also contribute to sleep apnea in the same way that it does in adults. The more fatty tissues in the throat, the more likely that breathing can become disrupted during sleep as the extra soft tissue can more readily restrict airflow. However, obesity is only believed to be a factor for sleep apnea among older children, 12-18 years old, and not younger children. How can child sleep apnea be diagnosed? Scheduling an appointment at a sleep facility for an overnight polysomnogram is the most efficient way to diagnose or rule out the presence of sleep apnea in your child. Pediatric polysomnograms are nearly identical to adult polysomnograms in that they measure nearly all of the same activity including brain activity, breathing, muscle movements, heart rate, and blood oxygen levels. 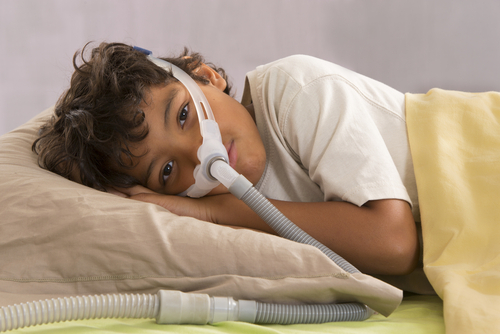 One extra piece of equipment is used to diagnose sleep apnea in children is that end tidal CO2 is additionally monitored. To ensure the comfort and safety of children undergoing a sleep study, parents are encouraged to sleep in the child’s room in a separate bed. Positive diagnosis for child sleep apnea also differs significantly from a diagnosis in an adult. Because enlarged tonsils and/or adenoids are the most common cause of sleep apnea for children, having surgery to remove the tissues often corrects the symptoms of sleep apnea in 90% of cases. For children whose sleep apnea is attributed to obesity, weight management and lifestyle programs are usually employed to help children manage their weight. Techniques can include nutrition and exercise programs. Continuous positive airway pressure (CPAP) therapy may be recommended. Oral/dental appliances may be recommended for older children whose facial bone growth is mostly complete. Allergy medications may be recommended if seasonal allergies cause or aggravate symptoms of sleep apnea. If seasonal allergies cause or aggravate symptoms of sleep apnea, allergy medications are recommended. If respiratory disorders contribute to sleep apnea, asthma medications or inhalers can help.